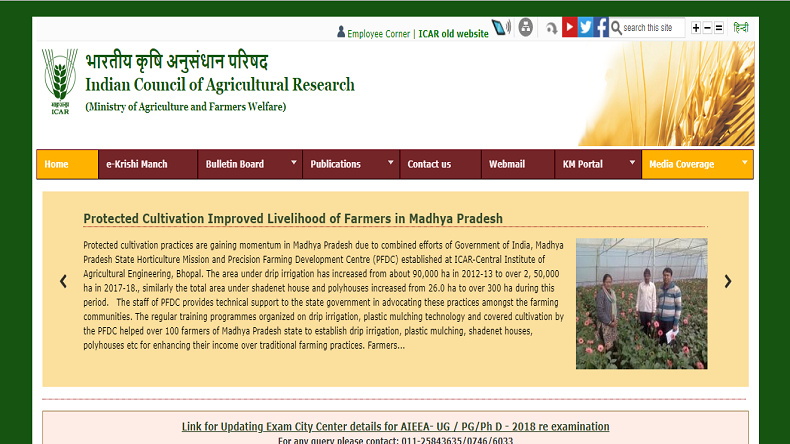 ICAR AIEEA 2018: The Indian Council of Agricultural Research (ICAR) is all set to release the admit cards for AIEEA UG / PG / SRF examination on its official website, icar.org.in. Candidates who are going to appear for the ICAR AIEEA exams this year are advised to log in to icar.org.in to download their ICAR AIEEA admit cards as soon as it is published. ICAR AIEEA 2018: Indian Council of Agricultural Research (ICAR) is all set to release the admit cards for AIEEA UG / PG / SRF examination on its official website today, August 7, 2018. Candidates who are going to appear for the examination are advised to log in to icar.org.in to download their admit cards as soon as it is published. Indian Council of Agricultural Research will be conducting the All India Entrance Exam for AIEEA-PG courses on August 18, 2018, and that of the AIEEA-UG courses on August 19, 2018. Those who had initially applied can download admit card for ICAR re-exam 2018 for the UG programmes.